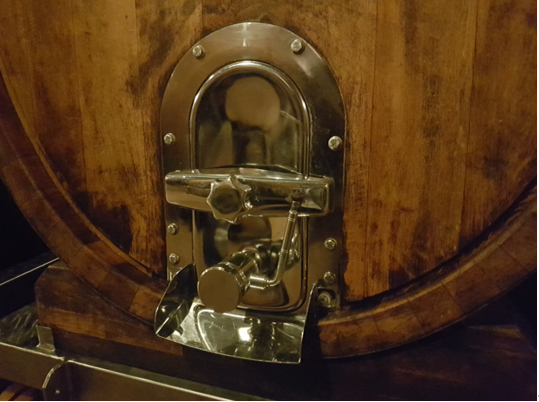 In my previous Six Senses blogs, I compared wines with fuel cell-electric vehicles (FCEV). 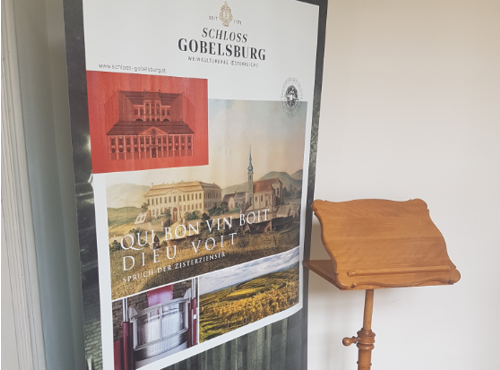 On May 5, 2018, the Tour de Vin was held at Schloss Gobelsburg, Langenlois. I drove there from Vienna and tested the FCEV and tasted some new wines. 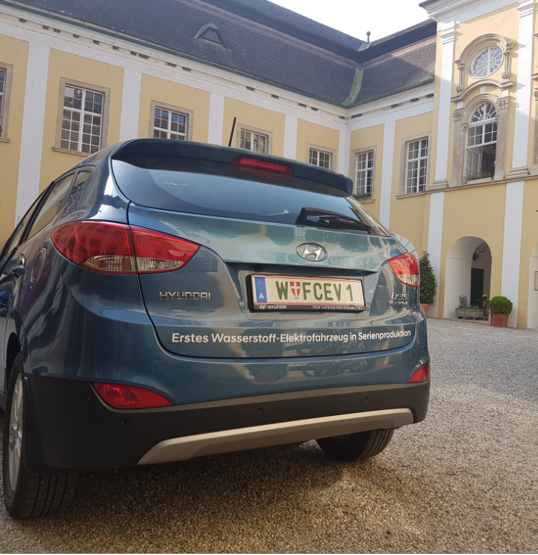 The FCEV tested was a Hyundai ix35/Tucson FCEV (thank you to Hyundai Austria for letting me test it), and the wines tasted were a selection of sparkling wines, rosé, white and red wines and sweet wines; all from Schloss Gobelsburg. I am writing this blog to offer an account on using future mobility technology, such as the FCEV, to reach an interesting and cultural destination on a fine Saturday, and then to report on my findings, holding presentations and workshops as my company solutions in energy. The winery Schloss Gobelsburg is located in the state of Lower Austria in the North-Eastern part of the Republic of Austria. The original castle was built in the year 1074, then completely re-built during the Renaissance era and since 1996 it is run by Family Moosbrugger. It is an hour’s drive to the North-West of Vienna, Austria’s capital. The next larger city, direction South, is Krems an der Donau (at the river Danube). Within a hundred mile-radius of the castle, there are three hydrogen refuelling stations. The two nearest ones (both OMV) are Vienna Shuttleworthstrasse (70 kilometres/44 miles East; use highways S5 and A22) and Wiener Neudorf (108 km/68 mi South; use highways S5, S33, A1 and A21), both in Lower Austria. The third one (to the West) is Linz/Asten (145 km/91 mi; highway A1) in Upper Austria, also operated by OMV; look out for a blue and green label and three large letters, the roof over the hydrogen pump is shaped like a surfer wave. 3 Why drive in an FCEV to test Schloss Gobelsburg wines? As for my personal profile, when I am moving around town, as in Vienna, I like to take the public transport, the bicycle or I use car-sharing. But when travelling across the country, especially for business, I can get on the train or take an electric car that does not produce any carbon emissions (at least not while driving). A fuel cell-electric vehicle is a car with an electric engine where the power does not only come from a battery but, in addition, also from a fuel cell to increase the range. Hydrogen is stored in gas cylinders and is supplied to the fuel cell to react with oxygen from the surrounding air. With a range of 500 kilometres/300 miles on average, I need 3 minutes to refuel hydrogen. I am comfortable with a cruising speed of 110 km/h or 70 mph; as going faster means higher energy consumption and less range. 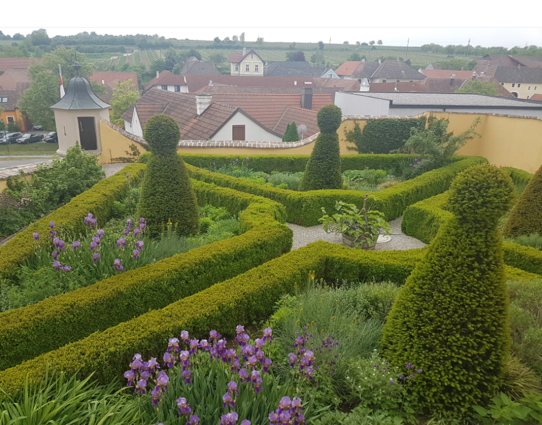 Having started in Vienna at 10:00 am, I reached Schloss Gobelsburg after driving for one hour. 4 How does it feel to drive an electric car or a fuel cell-electric vehicle? Apart from my senses telling me that the car looks good and my view out the windows is superb and that it smells nice inside, I also tasted the H20-water that came out from the exhaust (see video March 2017: REN Talk “Hydrogen Challenge” – Mortimer). 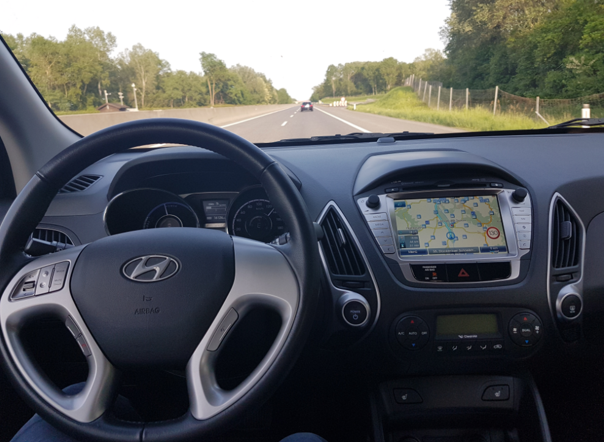 The steering wheel feels fine, seats are perfectly-shaped and the controls and buttons are all functional and efficient. When an SUV is on the move, you notice it, also as a pedestrian. From the inside, thanks to the electric driving, you hardly notice that it is an SUV, because it feels as if you are floating. As for the noise, I hear the traction of the wheels, wind noise on the windows, a cooling pump, the hydrogen valve, the H2O-exhaust and a ding-ding when the gear it set into reverse. When I accelerate, the revving up of the electric engine goes something like “vv-vhh-hhm-mm-nn-nn…”, reminding me of my remote-controlled toy car when I was a child. There is a similarity to wine-tasting when FCEV-testing, in that I heard people at the Tour de Vin several times say: you just try a wine, put your nose into the glass, take a small sip on your lips, tongue and gums, and see if you like this wine. With the FCEV, I say: take a seat, press the Start-button and start driving. How does it feel? In either case, you decide if you like it or not. In the first floor of the castle, some three dozen different wines from Schloss Gobelsburg were presented. Before leaning into the white wine bottles, I opened my SIX SENSES Part III experience with a sparkling wine (BRUT RESERVE , consisting of two white wine grapes and one red wine grape, Grüner Veltliner, Riesling and Pinot Noir), fresh and smart. To the sparkling wine! The rosé, called CISTERCIEN  (Zweigelt, St. Laurent and Pinot Noir, three red wine grapes), received its name from the monks that legally own the castle as proprietors, while the Family Moosbrugger is the owner and operator of the estate and the wine production. It was fruity in taste, thanks to the Pinot Noir. To the rosé! LÖSS  – of the many Grüner Veltliner white wines, common for the Kamptal region, LÖSS is named after the rock type under the ground, translating to loess, which features a humidity of up to 80%, it is a rather light wine and has less acid than other Grüner Veltliners. To the LÖSS wine! MESSWEIN  – receives its name from the mass (as held in churches) and has to comply with high quality standards. There is a sense of harshness, but not spicy. To the MESSWEIN! DOMAENE GOBELSBURG KAMPTAL DAC  – Kamptal is the name of the wine region in Austria (16 wine regions in Austria in total). It spans across 3,907 hectares; 15 square miles. The grapes in this bottle are from within this area. I really could taste different parts from the wine region, amazing. To the KAMPTAL wine! LANGENLOIS  – These Grüner Veltliner grapes are from the vicinity around Langenlois, just North of Gobelsburg. This one was a bit fresher and a bit spicier than the others. I was told that for this one the grapes are pressed a little later; in February. To the LANGENLOIS wine! So far, these were the lighter ones. On the following wines, emphasis is laid on a specific reed (pending Sun hours and angle) and on the vinification process (for example yeast), though they are all still the same grape type. It is a becoming a bit like driving the FCEV in rough terrain or at higher speeds. The first was the RIED STEINSETZ , nearby Gobelsburg. I instantly noticed, that these more sophisticated wines need to be accompanied with a meal rather than just being mere drinking wines. To the STEINSETZ wine! RIED SPIEGEL  – This was the first 2016 wine, as the previous ones were all 2017. As mentioned, the reed wines become more sophisticated, and tasting particular elements combined with some describing words by the kind staff, telling one what to look out for, seems as intricate as trying to understand how the FCEV moves between fuel cell and electric engine and battery, and transferring excess power back to recharge the battery. My analogy to the word Spiegel (meaning mirror) here is, as if one were to hold up a mirror and look at oneself and see the World behind you go past. To the SPIEGEL wine! RIED RENNER  – During a wine cellar tour between my tastings, held by Mr. Peter Schuhberger, it was said that this is a good seafood wine. After having tasted it, I could imagine that so may be the case. But it shall experience that on separate occasion. To the RENNER wine! RIED GRUB  – Mr. Schuhberger said that the reed GRUB and the next one (LAMM) were situated among two prominent hills, to the North, called Heiligenstein and Gaisberg. The Schloss Gobelsburg wine Family share these hills and the various reeds with other wine Families. They have in common the rocks, weather, wind and Sun, precipitation no less, but, once harvested, each Family goes into their own procedure. I found it fascinating that 200 million years ago, these two hills were 9,000 metres / 30,000 feet high. Back then they were part of the same massive that stretches across to the Appalachian Mountains. Heiligenstein is more of a pancake plateau with round ends, and Gaisberg to the right, when looking North, a bit like the top of a cupcake but without the chocolate chips. To the GRUB wine! 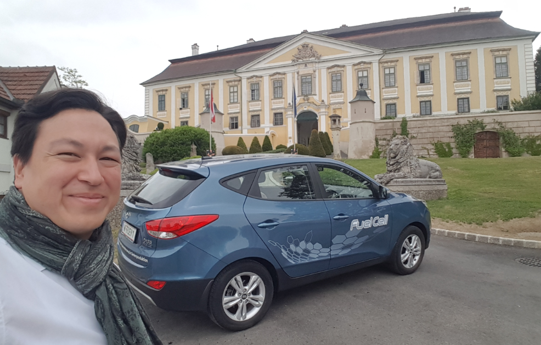 RIED LAMM  – Remembering that the FCEV, I am testing, is a Korean car, here come Schloss Gobelsburg’s wines for spicy Asian food: both GRUB and LAMM. I later chose to buy these wines as well, to go take them and test in combination with spicy Asian food. Let’s see. One more specific comment on the LAMM, the presenting lady Ms. Julia kindly said that due to the grapevine mounted on a V-like structure of the vine stock, the Sunlight engulfs the grapes from all around, compared to common vine stocks in an upright position. To the LAMM wine! 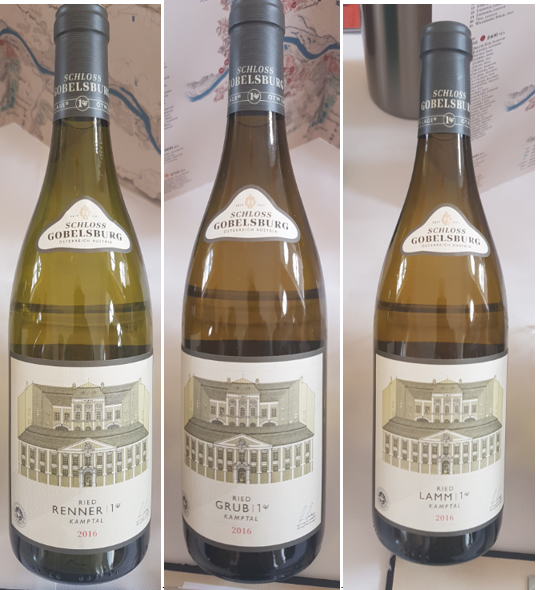 After so many different Grüner Veltliner wines from Schloss Gobelsburg, I also tested three Riesling white wines and two sweet wines, one from the Grüner Veltliner grape and one from the Riesling grape. But I shall venture to learn more about those another time, maybe on the Tour de Vin 2019, or when I shall pass by Schloss Gobelsburg in an FCEV on another occasion. Some thirteen years ago, I had learned in a wine course to first look at the wine, then smell it, before tasting it on my gums and so on. It is due to that that I applied the same procedure when I first encounter cars with alternative technology, such as compressed natural gas (CNG), pure battery electric, hybrid and fuel cell. The SIX SENSES Part III wine-tasting has taught me a lot about one single grape type, whereas before I was testing different grapes and comparing those to the FCEV. Next time, I shall reduce and refine, but I will try to come again in some form of future mobility. While driving to and fro, I was studying the hydrogen consumption at different speeds and different accelerations. 1-1.5 kilograms per 100 kilometres hold true when I drive between 100 and 130 kilometres per hour. At acceleration the gauge may shortly show 5 kilograms. By simple calculation, say I have 5 kilograms of hydrogen in the tank, I can drive a range of 500 kilometres. If I have been stepping on the gas pedal, then the consumption would augment to 2 kilograms on average, meaning I get half the range, so 250 kilometres. As for autonomous driving, of course it may come in handy after testing several wines, but I wonder what it is like. In the picture above, I am steering with my knee. Still, I love driving too much, and I would not let go of the steering wheel. 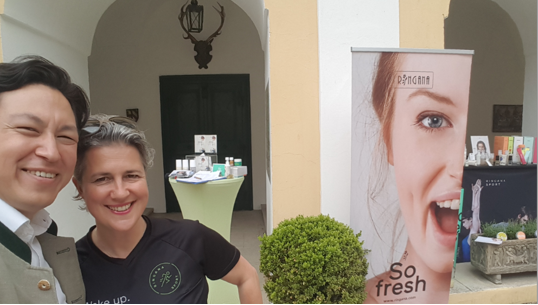 Please allow me to present this fantastic person, Mrs. Michaela Grüttner, and the products for body care she was presenting in the courtyard of the castle. Again, as with the wine and the FCEV, you just have to test them on yourself. They are made from natural substances, the packaging is reusable and the Family Wilfinger, who used to run eco-friendly hotels before, has put a lot of into making this place a better World, but keeping it simple. And for further information, please see Ringana or her own website. Of course, I could not resist tasting one red wine from Schloss Gobelsburg to top the day, a MERLOT . In short: it was SOLID. To the MERLOT! As solid as the electronic wine decanter, presented by Mrs. Ulla Neusser. See picture above. 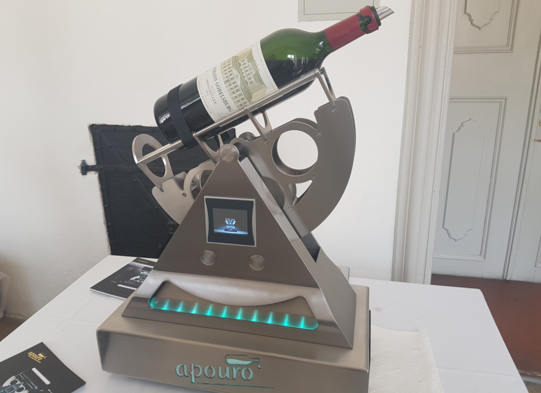 By the push of a button, this sextant-like apparatus, powered by a Lithium-ion battery, swirls the wine, or other alcoholic beverage to your liking, into the glass, and retracts automatically, giving you the exact amount required. The turquoise LED-lights can be individually conceptualised according to your preference. Just get in touch with www.apouro.com I think this will go great with some wine lovers; and, I must say, it does have something James Bond-ish about the design. 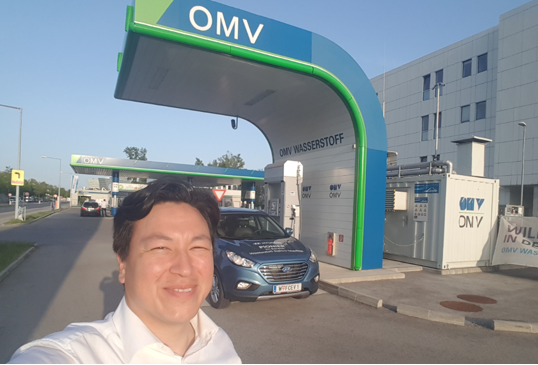 Finally on my FCEV way again, heading from Schloss Gobelsburg direction South-East to return to Vienna, I stopped at the OMV hydrogen refuelling station Shuttleworth Street No. 10 in the Viennese suburb of Floridsdorf. Along the national roads B34 and B35, and following highways S5 and A22, I took Exit Floridsdorf; the navigational aid did the rest. First the Austrian automobile club ÖAMTC appears on the right (yellow building) and then the hydrogen refuelling station right after. On May 5, 2018, I refuelled 1.79 kilograms of hydrogen. Said differently, when arriving at the station I had 220 bar pressure of hydrogen gas left in the tank equal to a range of 194 kilometres/121 miles. After having replenished to 540 bar (though not the full 700 bar), 1.79 kg of gasous hydrogen, I was given a new range of 316 kilometres/200 miles. I reached Central Vienna at 7:00 pm.